As Partner and CEO of DAISA Enterprises LLC, he specializes in supporting development of food & environmental enterprises and programs in underserved communities. Works with entrepreneurs to strengthen business plans as well as the mission-driven investors and funders wanting to maximize their impact. Recognized as a leading social entrepreneur with a lifetime fellowship from Ashoka – Innovators for the Public Good. As Chief Operating Officer he helped Wholesome Wave Charitable Foundation Ventures, a national nonprofit organization dedicated to reinventing the world we eat in with innovative programs and policy solutions, triple in revenues, staffing, and partnerships over three years. At Wholesome Wave he launched the Investments program, connecting “food hubs” with impact investment capital, developed new collaborations and strategies to support the scaling of the Fruit & Vegetable Prescription Program into the health system. Developed new partnerships for disseminating program models internationally in India and Canada. As Executive Director of Nuestras Raíces, a grass-roots organization promoting economic, human and community development in Holyoke, Massachusetts, Daniel spent 16 years developing projects relating to food, agriculture and the environment, and the organization and his work has been nationally recognized for innovation. Daniel helped community members start over a dozen small food and agriculture businesses and he launched Energía, a social enterprise energy-efficiency services company employing formerly incarcerated young people. 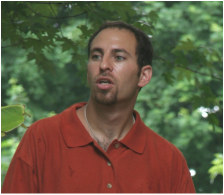 Daniel is also a founding leader of various local and MA state-wide food systems and environmental policy coalitions. Daniel has helped businesses and nonprofits secure millions of dollars in funding through the preparation of successful business plans, pro forma and dozens of applications to prominent foundations and federal agencies, ranging from HHS & EDA to EPA & USDA (including Community Food Projects, Food Insecurity Nutrition Incentive Program, Risk Management Agency & Risk Management Education, Farmers’ Market Promotion Program, Beginning/Immigrant Farmer Initiatives, Specialty Crops and USDA/EDA Innovation Clusters). He holds an MBA from MIT Sloan, and has been an MIT Sloan Fellow for Innovation and Global Leadership, MIT Legatum Fellow for Development and Entrepreneurship.